US Secretary of State John Kerry, left, and Chinese Foreign Minister Wang Yi shake hands after a news conference following meetings at the Ministry of Foreign Affairs in Beijing, China on Saturday. China’s foreign minister told top US diplomat John Kerry on Saturday that Beijing was “unshakeable” in its defense of sovereignty, as tensions between the powers mount over Chinese island-building in strategic but disputed waters. The United States is weighing sending warships and surveillance aircraft within 12 nautical miles — the normal territorial zone around natural land — of artificial islands that Beijing is building in the South China Sea. Such a move could lead to a standoff on the high seas in an area home to vital global shipping lanes and believed to be rich in oil and gas deposits. “That’s a principle that we are determined to uphold,” the official added. The world’s top two economies have significant commercial ties and Chinese President Xi Jinping is due to pay a state visit to the United States in September. But China’s ambitions for a place on the world’s political stage commensurate with its economic role have seen it cross the United States in multiple fields, and the two have long-running disputes over issues ranging from trade to cyberspying to human rights. At the same time the United States is China’s second-biggest trading partner after the European Union, with two-way commerce worth $555 billion last year, according to Chinese figures. Beijing is the heavily indebted US government’s biggest foreign creditor, figures from Washington showed Friday, reclaiming top spot from Japan with more than $1.26 trillion in Treasury bonds. Kerry was due to meet senior political and military leaders later. Beijing bases its territorial claims in the South China Sea on a segmented line dating back to Chinese maps of the 1940s. US officials increasingly believe Washington needs to send a clear signal about China’s activities around the Spratly Islands and other disputed territories, while avoiding triggering a crisis. Pentagon officials last week revealed that Beijing is building artificial islands on top of South China Sea coral reefs at an unprecedented pace, in a land reclamation effort dubbed a “great wall of sand” by one American commander. The rapid construction comes to 2,000 acres (800 hectares), with 75 percent of the total created in the last five months alone, and includes a runway said to be 3,100 meters (10,200 feet) long. US government officials stress that under the UN Convention on the Law of the Sea, only natural land masses create a territorial claim, not artificial islands. “You can’t build sovereignty,” an official said. But the United States has never ratified the convention itself. Beijing’s increasing assertiveness has raised deep concerns across the region in recent years — as well as its South China Sea claims, which overlap with those of the Philippines, Vietnam, Malaysia, Brunei and Taiwan, it is in dispute with Japan over islets in the East China Sea. Beijing defends the island-building as taking place within its own territory and intended to enhance its ability to carry out international obligations such as search and rescue. “The United States is not a party in the South China Sea disputes, which are between China and other claimants and should be handled by those directly involved,” it said. 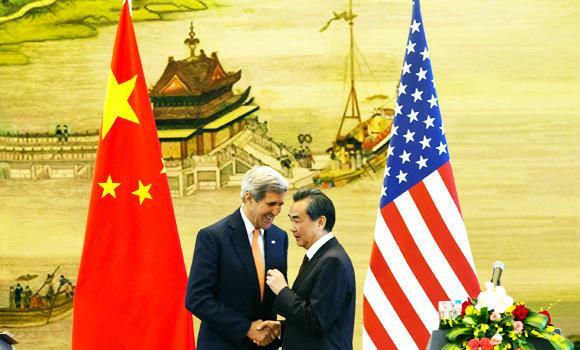 The United States is pursuing a foreign policy “pivot” toward Asia which has rattled China.